The three-story Princess Anne Hotel was built by registered nurse Anne O'Connell in 1922. 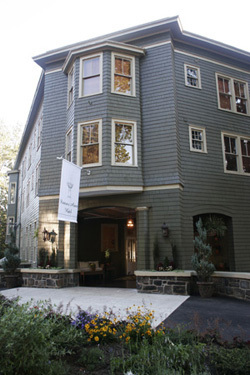 The hotel played an important role in the Chestnut Hill neighborhood. Asheville was known as the Nation's most famous location for the treatment of tuberculosis and the hotel was located in close proximity to the home of Dr. Karl Von Ruck, the world-renowned tuberculosis specialist. The motto of the hotel management was "Comfort First" as the accommodations catered to the families of patients that resided in O'Connell's tuberculosis sanatorium, which she owned on Baird Street. According to long-time resident Edith Holmes, O'Connell was remembered as having long red hair and "her head was set on her shoulders perfectly beautifully and her patients called her Princess Anne." O'Connell ran the hotel for several years before selling it in 1929. 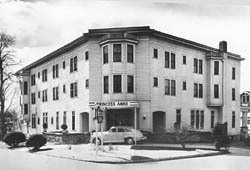 The Princess Anne was operated as a hotel by various owners until 1945 when it became an annex to Appalachian Hall Psychiatric Hospital. In 1947 it reopened as a hotel and since 1957 has specialized in retirement accommodations. During its years as a boarding house the hotel was advertised as "gracious living for senior citizens, wholesome well-balanced meals" with "beds that refresh, food that pleases." Every room featured a private bath and phone. One of the hotel's most recent and notable residents was activist Florence Ryan. Ryan spent most of her life committed to voter education and registration and fighting for women's equality. In 1985, Ryan was honored by the North Carolina Council on the Status of Women and was the recipient of a "Distinguished Women of NC" award. At age 97, Ryan was active with the League of Women Voters in Buncombe County and drove fellow senior citizens from her apartment to the polls, and continued to do so until her death in 1994 at age 99. In 1995, the Hotel was sold once again to the Maharishi Ayer-Ved University of North Carolina, founded by followers of Maharishi Mahesh Yogi, who brought transcendental meditation to the United States and was the famed spiritual leader of the Beatles. The Princess Anne Hotel was completely renovated in 2005 and is now a 16-room inn. The Princess Anne Hotel is located at 301 E. Chestnut Ave., within the Chestnut Hill Historic District. For more information on lodging, please contact the inn through their website or call 828-258-0986.